I know these are a marmite item but so if you hate them on everyone, they're probably not for you but if you like them but can't see them working on you, I urge you to get an inexpensive pair and try them for a while. If all else fails, you can always wear them as slippers. Overall, I find them more wearable than proper trainers and they're just a bit funky - and incredibly practical on the school run. There are tons of slip on trainers in the shops at the moment. Here are some of my favourites, starting with these Dune ones which are in the sale at the moment (limited sizes). The reviews suggest they come up big so to size down. and while you're on the Next site, check out the into Clearance Shoes here and scroll down till you see these 'Borg Skaters' available in lots of sizes for £12. I can't share a direct link but I bought these back when the sale started and I've been wearing them also this week. They're made from a kind of felt material - hopefully you can see it in my photos. or how about gorgeous grey with studs, also from Dune? New Look have these great quilted ones - very Chanel-esque! Gucci Slip On Trainer - a relatively affordable way to inject some Gucci into your wardrobe perhaps?! Fab new slip ons Avril, I've worn my Boden ones so much. Great to see you again, I love skater shoes, I was a little reluctant to start with but love them now. I seriously struggle with these, as I love them on others, but any that I've tried have been too wide on me. It's not just that they make my feet look huge, they are genuinely too wide when wearing them . Any suggestions on where to find narrower fitting ones? I love them! Been hankering after some myself so you've persuaded me! 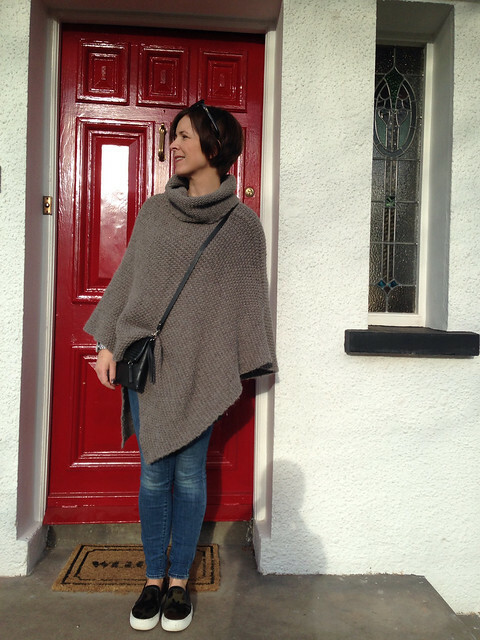 Love your poncho and mac too - where is the latter from? 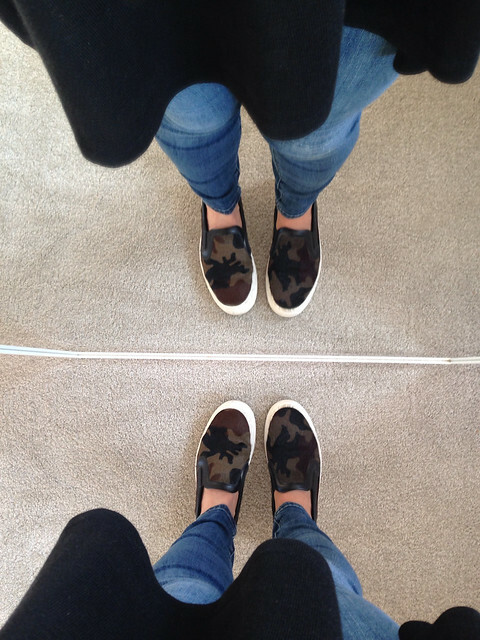 Yay - nice to see you back in blog land and I did notice your new skate pumps when you were in London! 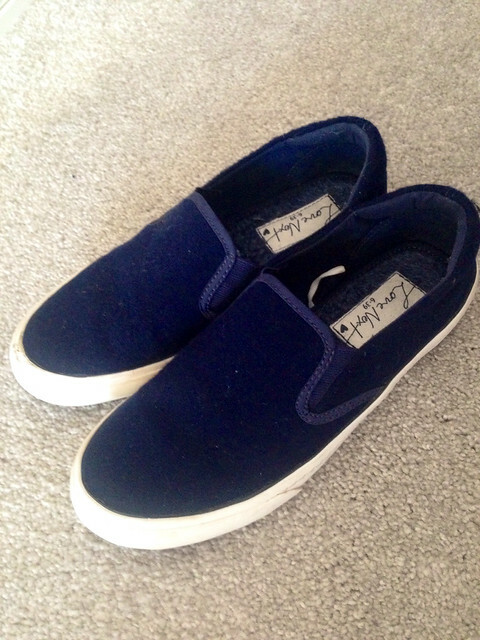 I really like them and find them super easy to wear - I have the grey version of your navy felt version - I love the fleecy insole! 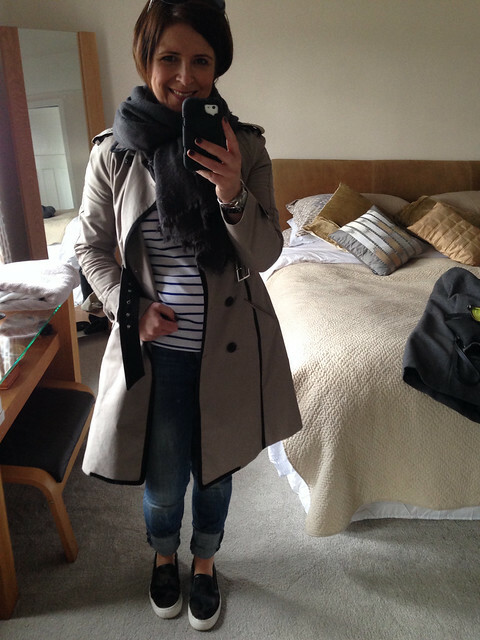 Oh how I've missed the fashion blogging Avril, pleas tell us where the lovely trench coat is from? I'm on the lookout for a new one, particularly one like this with contrast trim a la Karen Millen. I need to get some this summer - I've seen so many different styles and everyone looks fab in them. I really your camo ones. Please re-open the shop soon. I've got scarf withdrawal!